Professional Photo Shoot in Liverpool City Centre – just £50 per head! 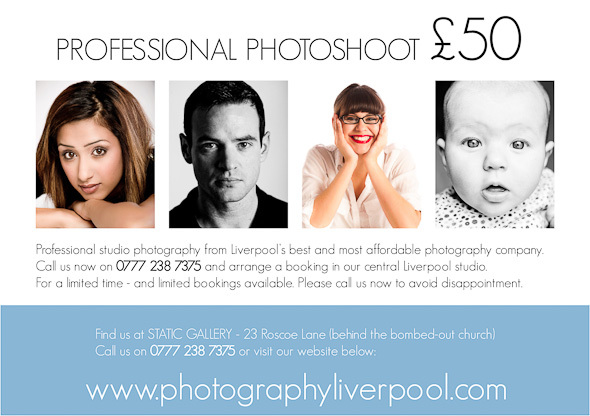 For a limited time only we are offering a portrait photography special in our Liverpool City Centre studio. Whether it’s actor’s head shots, corporate profile shots, University graduate shoots. We are offering this amazing special for the month of July. There are no hidden extra costs – you receive 10 edited images of your choice as digital files. We are based in STATIC – 23 Roscoe Lane – (behind the bombed-out church). This entry was posted on Monday, July 8th, 2013 at 3:17 pm. It is filed under corporate portraits, Portraits and tagged with centre, city, graduates, Graduation, liverpool, photo, professional, shoot, studio. You can follow any responses to this entry through the RSS 2.0 feed.